Despite being overcast with a head wind home straight the Cambridgeshire County Championships proved to be a successful outing for NVH. Here's Ken's report. Despite being overcast with a head wind home straight the Cambridgeshire County Championships proved to be a successful outing for NVH. Highlight of the day came from under 17 ladies shot putt. Nene Valley Harriers took a clean sweep of medals but most noticeably, Tierney Augustine who not only took gold but also the club record and Championship Best performance with her throw of 11.54 just piping Pricilla Dadziea and Lydia Church. The club ended the day with 23 County Champions and a further 38 medallists. There were some great individual performances, Ollie Bowling's silver in the under 17 1,500m being a close contest right through to the line with Ollie just being unable to complete his challenge for the title. 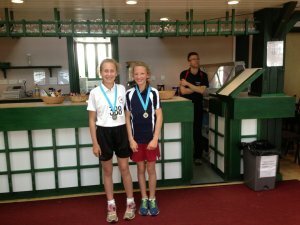 The under 15 girls 300m in which the Nene Valley girls were only split by one other athlete but Kelsi Ellis winning after a strong first 200m and being followed in by a closing Amber Park. Chloe Squires was unlucky to miss out on bronze but still recorded a good personal best. The under 17 ladies discus was also dominated by the club as the young ladies took 4 of the top 5 positions, Tierney's massive throw of 29.05 being strong enough to take the county title. Josh Akinwumi was also a double county champion winning the under 17 men's short hurdles and long jump. We also have some images for this race, click here to view them. Flo Brill and Katie Tasker. For more images click [link type="Gallery" id="668443"]here[/link].